Mancini grew up as neighbors with Pittsburgh Pirates outfielder Matt Diaz, a Lakeland, Florida resident. Mancini was a member of the Sunshine State's heralded 2010 high school class, and he showed off against some of the state's top competition, when he led Polk County in hitting. In 2010, Trey graduated from Winter Haven High School in Florida, hitting .480 with 23 runs scored, 10 doubles, six home runs and 31 RBI and registered a .506 on-base percentage and .853 slugging percentage. Trey's freshman year at Notre Dame (2011), he led the Fighting Irish team in the triple crown categories by hitting .323/.385/.577 with 9 home runs and 34 RBIs, earning Big East Rookie of the Year honors. In 2013, his junior year, Mancini led the Big East Conference in batting (.389), and total bases (138) while ranking 2nd in slugging (.603). June 2013: The Orioles chose Mancini in the 8th round, out of Notre Dame. And he signed for a bonus of $151,900, via scout Kirk Fredriksson. In 2014, the Baseball America Prospect Handbook rated Mancini as the 25th-best prospect in the Orioles organization. He fell to #30 in the spring of 2015. But a fine 2015 season moved Trey all they way up to 8th-best in the O's farm system in the winter before 2016 spring training. And in the spring of 2017, they had Trey at 5th-best prospect in the O's system. Trey provides leadership to a clubhouse. He has a great attitude. A solid makeup guy and a winner. Mancini really wants this big league career thing to happen. He comes from a good family in central Florida. 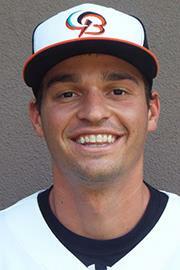 In 2015, Mancini was named the Orioles Minor League Player of the Year. Trey slashed .341/.375/.563 with 21 home runs, 89 RBI, and 70 total extra base hits across High- and Double-A. Mancini won the Eastern League batting title by hitting .359 in 84 games after being promoted to Bowie. With Bowie, Mancini was also part of a championship-winning team. The 6’4″ first baseman also nearly halved his error total, down from nine in 2014 to just five in 126 total games. On his way to a .341 batting average, Mancini recorded 15 three-hit games and two four-hit games. September 20, 2016: There may not be a better way to endear yourself to a city in your Major League debut. With the Orioles hitless through 4 2/3 innings Tuesday night, Trey Mancini stepped to the plate for his second-career at-bat and crushed a homer to left-center field for his first big league hit in the Orioles' 5-2 loss to the Red Sox. Sept 24, 2016: Orioles rookie Trey Mancini is making quite the name for himself in a short period of time. Mancini, became just the third player in Major League Baseball history to homer in each of his first three starts with a solo blast in the 6-1 win over the D-backs. "It's been incredible, you know?" Mancini said. "I could never imagine it happening this way, and it's still hard to believe. A week ago, I was down in Florida prepared for this, but it's cool, a week later, with everything that's happened, to be here in Baltimore and to contribute to it, to a postseason run." Mancini, who joins Trevor Story (who also did it this year) and Carlos Quentin, went deep off D-Backs reliever Robbie Ray to open the fourth inning and give the O's a 3-0 lead. "That's a great, great guy. He's having a lot of fun, too," said Orioles outfielder Mark Trumbo, who hit his MLB-leading 45th home run also. "It's really impressive. This is a tough level; he's facing real quality pitching up to this point, and he's made the most of it." According to his former college coach, there's still a role Mancini could excel in at the big league level. "[Orioles manager] Buck Showalter could tell him that he has to clean the bathrooms every single day to get playing time, and he'd be in there cleaning the bathrooms," Notre Dame baseball coach Mik Aoki said in a Glenn Clark Radio interview April 19, 2017. Mancini was already on the Fighting Irish roster when Aoki left Boston College to take over the Notre Dame program in 2011. Aoki had heard from an assistant that Mancini was a good hitter, but it wasn't enough for Aoki to fully jump on board immediately. "The one mistake I made with Trey is that he didn't start his very first game of his college career," Aoki said. "That's probably the one mistake that I made, that he sat on the bench in his very first game. But I corrected that pretty quickly, and so he started every single other game, I think, along the way as long as he was healthy." That decision paid off, as over the course of the next two seasons Mancini hit .320 with 21 home runs and 79 RBIs for the Irish in 107 games. The skill set that allowed him to work his way through the Orioles' system was on display quickly. "The thing that I think I really came to appreciate is he's a really aggressive hitter," Aoki said. "So sometimes you can make him look bad early in a count, throw him a slider when he's looking for a fastball-type of a thing. But the thing that I really became appreciative of with him was the way that if a pitcher went back to that same well, they often times played a pretty severe price for it. "It's just his pitch recognition and his ability to just make adjustments in the course of one at-bat was really, really impressive. And it was something that you had to see over a period of time to really, truly appreciate it." As much as Mancini's baseball ability has carried him to a place where he's become Baltimore's newest baseball folk hero, his former coach believes his qualities as a human being have played an equal role. "I believe really, really strongly that long-term success in anything you do is driven by the character of the person," Aoki said. "Trey comes from a great family; Beth and Tony are phenomenal people. His sisters are great kids, and Trey is just a terrific, terrific human being. I think that when he gets back to who and what he is—he understands the hard work that goes into it, he understands that team-first mentality." Yet Aoki warns those qualities shouldn't be taken for granted. When Trey was a kid, he told his father, Tony, that he wanted to be a professional baseball player. Despite how difficult that path can be, there was no doubt in Tony's mind that it could happen. "[My parents] thought it was awesome," Mancini said. "I think they were kind of like me, someone's got to make the Major Leagues. You know, there's a 4-year-old right now that's going to make the Major Leagues one day. So why not me?" Growing up, Mancini lived just 30 minutes from Disney World, which is where the family would always go out to dinner for Father's Day. But this year, the family will be going out in Baltimore, after Tony spends his Father's Day watching his son play at Camden Yards. Between the ages of 3 and 5, Mancini would spend the majority of weekends at Disney. When he wasn't at the park, Mancini was outside playing catch with his father. Although Tony was a doctor and did not always have a lot of spare time, any free second went to playing with and supporting Mancini in any way he could. Trey has a lot of baseball memories that he has shared with his father, but the one that sticks out most to him is from when he was just 5 or 6 years old, playing T-ball. "We had like 100-foot fields, so we could actually hit home runs at the time," Mancini said. "And I remember hitting my first home run of my life and I remember my parents behind home plate with their arms up. You know, they were really happy. I just remember seeing them as I was rounding the bases. It was awesome." Not only did his parents support him in the bleachers, but, as many parents do, they also made a lot of sacrifices for him to be able to pursue baseball as a career that he has not forgotten. "They sacrificed a lot for me," Mancini said. "There were probably some cool vacations that we could've gone on and stuff but we were staying at Best Westerns in the middle of nowhere for baseball tournaments. Stuff like that I definitely don't take for granted." The closeness that Mancini had with his father has not gone away. Father and son talk at least once each week, and the humility Tony has always had has never changed. Tony has always stressed a team-first mindset that Mancini has carried with him throughout his baseball career. In June 2017, in a game against the Pirates, Mancini had a pinch-hit, game-tying home run in the ninth inning before hitting a walk-off home run in extras. The slugger heard from his dad after the game, but the praise was not on his individual performance, but the team's success. 2017 Rookie Year: Mancini had a 17-game hitting streak from Sept. 11-29, the longest by a rookie in club history and the longest by a first-year player in the Majors this season. Mancini's 159 hits ranked first among qualified rookies, finishing ahead of Astros first baseman Yuli Gurriel (158), Benintendi (155), and Judge (154). He also led rookies with 47 multi-hit games and was second in batting average, third in slugging percentage, fourth in on-base percentage, fifth in RBIs and tied for seventh in home runs. In a year without Aaron Judge, Mancini would have had a strong case for winning the AL Rookie of the Year Award. The only two Orioles with more homers in their rookie season were Hall of Famers Cal Ripken Jr. and Eddie Murray. Mancini finished 3rd in the AL Rookie of the Year voting. Nov 17, 2017: Country music superstar Brett Young got a VIP clubhouse tour and played catch with Orioles outfielder Trey Mancini at Camden Yards in a special interview that will air on Country Music Television's (CMT) Hot 20. The segment will air with Mancini and Young bonding and helping CMT host Katie Cook practice her grip. Mancini—coming off a breakout season in which he was named as an American League Rookie of the Year finalist— swapped baseball stories with Young, who was a college pitcher at the University of Mississippi. "It was an absolute pleasure to meet Brett," Mancini said. "I enjoyed getting to hear his story. He has a huge passion for baseball and you could tell he was excited to be back in a baseball park. It's a pretty cool thing for him to chase another passion and succeed after injuries ended his baseball career." Mancini and Young—whose baseball aspirations were cut short by an elbow injury—talked to Cook about how fans drive them and make their dreams and careers possible. While Mancini isn't a huge country music fan, Orioles manager and Mississippi State alumnus Buck Showalter is. Mancini is big and strong. He is focused at the plate and shows raw power but lacks consistency. He generates good bat speed and plus righthanded power from his strong wrists and big uppercut swing—scouts envisioning 20 dingers per year, eventually. And he has an advanced approach at the plate so that he can post high batting averages. Trey's all-out approach leads to questions about how much success he’ll have against pro pitching, because he can get himself out. So the Orioles asked him to stride into the pitch in 2013, and it gave him better balance and timing. He makes consistent hard contact and has improved his strike-zone discipline. He waits back well on breaking pitches with his disciplined approach. But he will chase a ball up (and out of) the zone. "Mancini's understanding of the strike zone has made great strides,” Orioles farm director Brian Graham said late in September, 2015. “He’s obviously shown the ability to hit the ball for more power this year. He’s used the whole field, which is probably the best part of his offensive approach. He’s shown the ability to drive the ball, he’s put together quality at-bats. "He doesn't draw many bases on balls, but doesn't strike out a whole lot, either. Mancini uses the whole field with a line-drive swing. But most of his power is to the pull side. He also has the strength to drive balls out to center and right field, also. His hole: Trey will swing through pitches up in the zone. "It's just the quality of his at-bats," Orioles director of player development Brian Graham said in 2015. "He's showing patience and better plate discipline. He's driving the and he's facing good pitching." Early in 2015, Trey changed his set-up in the batter's box. Instead of his old spread-out, lower stance, Mancini went more upright and narrow when digging in at the plate, allowing him to work more on balancing his load and his separation. "It's just the way I'm standing, and the whole pre-pitch routine is different," Mancini said. "I found it comfortable, and I'm into feeling relaxed when I play. I like it a lot. I just think about hitting everything back up the middle. I think that's helped [with the power]." Trey is just allowing things come together with a more relaxed approach. He is calm at the plate. And he has enough discipline to wait on a breaking pitch. He grinds out each at-bat, using his hands well and displaying good strike-zone discipline. Mancini displays plus power and a high average. He has impressive instincts for hitting and good hands. My whole approach is to hit the first good pitch I can hit, rather than trying to hit a pitch out of the park. And I'm trying not to miss pitches I can hit out," Trey said. September 25, 2016: Orioles rookie Trey Mancini made quite the name for himself in a short period of time. Mancini became just the third player in Major League Baseball history to homer in each of his first three starts. April 12, 2017: Trey became the first player in Oriole franchise history to hit 5 home runs in his first 10 games, something Mancini was pleasantly surprised to hear when asked about it by a reporter after the game. Mancini went 2-for-3 with 2 home runs and a walk and a career-high four RBIs. April 17, 2017: Through the first 12 games of his career, dating back to the 2016 season, Mancini had produced 7 home runs and 14 RBIs. He is just the third player dating back to 1913 to go deep seven times in his first 12 career big league games, joining Trevor Story (2016) and Dino Restelli (1949). As of the start of the 2019 season, Mancini's career Major League stats were a .268 batting average, 51 home runs and 305 hits with 141 RBI in 1,139 at-bats. Mancini plays left field and first base. Trey is athletic and pretty fluid around the first base bag, surprisingly so for his size (6-foot-4). But overall, his athleticism is marginal (or worse), and he has below-average hands and a bit below-average range at first base. His defense grades as solid-average, with speed that is a step below average, and an arm that is average, though his throwing motion is a bit stiff. Mancini displays good footwork around the bag. He is working hard to become more of a 45 or 50, instead of the 35 or 40 defender he is at first base (on the 20-80 scouting scale). His defense is not considered smooth. Many of Trey's errors come when throwing the ball. But his tireless work with the glove has made him adequate at first base. He makes the plays.